MedMinder has recently added a new feature to its pill dispenser and complementary medication management service. Responding to our valuable customer feedback, we have added a multi-week dispensing feature to our pill dispenser. Now our medication dispenser, unlike other pillboxes, can simply match the preference of users depending on their dosage frequency and ensure no compartments are left unused. 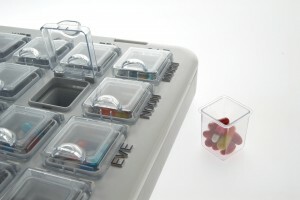 Our pill dispenser accommodates 1, 2 or 4 weeks worth of pills depending on how many doses are needed each day. If the individual doses only 1 time a day, the pill dispenser can be configured online through the MedMinder website to hold 28 days worth (1 month) of medication. When entering medication information on the website, the user/caregiver will be prompted if they would like their electronic pillbox to be a multi-week dispenser. This can be the same for those who dose only twice a day. By having the pill dispenser match the user preference, the patient and caregiver can save time by having the pillbox hold its maximum capacity. Users and caregivers can in turn save time and effort on refilling the medication dispenser.